Rawle Alkins is returning for his sophomore season. The Arizona Wildcats freshman guard has withdrawn from the 2017 NBA Draft, he announced on Sunday in a tweet. HUGE news. HUGE. Rawle Atkins, star point guard for the Wildcats will withdraw from the NBA draft and return to Arizona for the 2017-2018 season. Arizona was already loaded going into next year but you would have to believe that with Alkins coming back it makes the Arizon Wildcats National Title contenders and possible favorites. 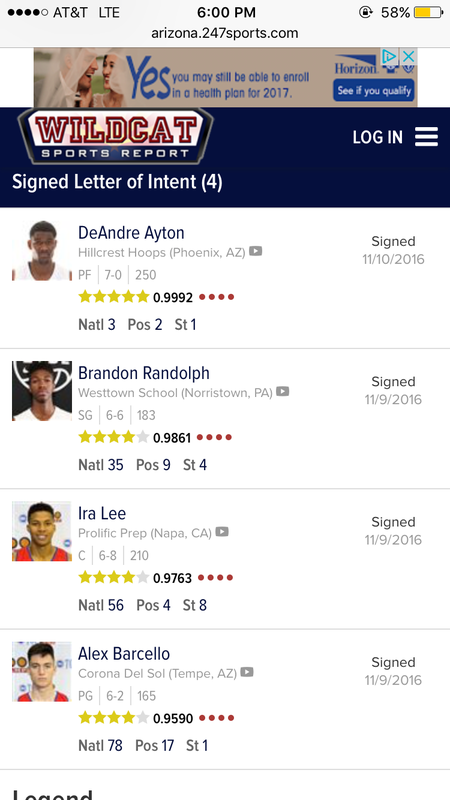 Arizona has one of the best recruiting classes coming next year, which is highlighted by the number 3 recruit according to 247sports Deandre Ayton. They have 3 other freshman that are very talented as well. The Wildcats will also be returning star shooting guard/small forward Alonzo Trier, guard Parker Jackson-Cartwright and center Dushanbe Ristic. Add that recruiting class, Arizona is going to cruise through the PAC 12. Oregon and UCLA won’t be as talented as last year and why’ll have a small drop off but USC will be very solid and strong. However, it will allow Arizona to absolutely dominate the PAC 12 because after those 4 teams the conference is decently weak. Rawle Alkins, the former Christ the King lion (I have ties to Christ the King, had to throw it in there) averaged about 10 ppg and 4 apg. Look for those numbers to improve. With the news of Alkins returning, Arizona should start the season #1 in the polls and get to Sean Millers first ever final four.